This was your most entertaining story yet. God I love me some alcoholic Irishmen who just won’t die! I am shocked that this isn’t a movie yet. Maybe we should go to LA and pitch together? You pitch – I’ll catch. Reminds me of a few people I knew…..
Must have been the antifreeze they gave him previously that caused the attempt to freeze him to death to fail. Where do you find these stories of people’s lives? No, don’t tell me, this way I have to keep coming back here for more. They’re great! I remember reading this in quite a few anthologies over the past few decades. Still never fails to amaze me whenever I read it. Yeah, I nearly didn’t post this one as I thought it might be too well known. He’s like that Rasputin fella. And as pickled as Bukowski was, it took leukemia to bring him down. I know you and I are in agreement about Bukowski. There’s never been anyone quite like him. Maybe John Fante…..
Fante! My God! Where have you been my whole life?! Sounds like Malloy was the inspiration for the Resident Evil franchise. Did anyone check whether he had a fondness for braaaaaaaains. you know, I’ve never seen any Resident Evil films. am I missing out on much? i’m really looking forward to some snow this winter. 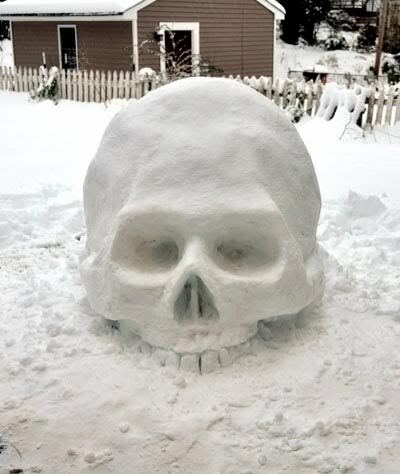 i NEED that snow-skull in my front yard! Don’t ya just hate it when someone refuses to die!! I wonder if Scotch and horse liniment is best served neat or on the rocks? Mr. Malloy seems like a fine lad in my book. I’ve always contended that regular drinking keeps you healthy, i know it’s worked for me. Bukowski’s not wearing beer goggles in that photo, he’s wearing a full beer sensory deprivation suit. What happened to the days when a man could take a life insurance policy out on someone totally unrelated without their knowledge. Those days are still here. Only now it’s called hedging. Malloy’s friends merely mis-marketed themselves. Yikes! He seems to have had 9000 lives or something! Brilliant story as ever! You like John Fante? Well he was Bukowski’s God! I will always be grateful to a californian ex who bought me a copy of the Road to Los Angeles as a birthday present. Irishmen do seem to have some remarkable attributes apart from their ability to drink. They also have produced some of the world’s finest literature. However, why didn’t they just club him on the head with something heavy? Um… perhaps because it would have made the insurers suspicious? What a great story! It reads like an Elmore Leonard novel. Malloy’s Murder Trust ‘friends’ were doomed to fail. They got their victim so relaxed he was incapable of dying. I adore that snowman! …. and I’m really annoyed I haven’t ever thought of building one …..
Years ago I had a copy of Locked in the Arms of a Crazy Life – a Bukowski biography. 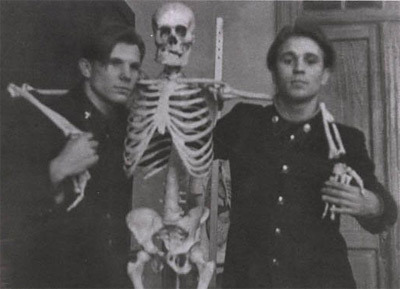 Lent it to someone, never saw it again but I’ll never forget a picture of his first(?) wife who had two vertebrae missing from her neck which gave her a somewhat unusual posture. I’ve got the Barry Miles bio, it’s pretty good too. Lacks photos though. Seriously, I can’t even wrap my mind around this one. Now I’m obsessed with this guy. Spoiled sardines mixed with turpentine? Quite the imaginative chefs. A wonderful story, Nurse Myra. It sets up like a joke – I half expected him to end up dying by slipping in the bath or something. I think he must have been related to Rasputin. Too funny! I had to immediately send a link to my 2 best friends, both of whom have the last name…MALLOY (although unrelated). They are not nearly as indestructible as this poor guy. I mean, I’ve never tried to kill them or anything, because I need all the friends I can get, but if I fed them sardines in poison, I’m pretty sure they’d die. This cat was a DelVecchian before I was even born. It was probably the firefighting that toughened him up. Mick was like Tim Finnegan, the bloke who fell off the ladder in The Ballad of Finnegans Wake. A splash of whiskey and he awoke – at his own wake. There’s a bar in Cambridge called Bukowski’s. This post has inspired me to pay it a visit again.